Love is in the air, and Valentine's hearts adorn the shops, so it's appropriate that this month we're focussing on ginger - a food that's reputed to be an aphrodisiac! We're not sure whether it will spice up your love life, but there's nothing quite like it for banishing the winter chills. Ginger enjoys a tropical climate and thrives in places like China, India, Asia, the Caribbean and Australia. The edible section is the rhizome, the subterranean part of the stem, and generally the younger the rhizome, the milder the flavour. Since time immemorial, people have sworn by ginger as a natural remedy for nausea, to relieve symptoms of the common cold, lessen the pain and inflammation of arthritis, as an effective expectorant and for its anti-bacterial properties (try it when you next have a sore throat). It is also purported to soothe indigestion, help with de-toxing and even to lower cholesterol by impairing its absorption into the bloodstream. Pretty impressive stuff. Of course, this ancient spice is not just prized for its reputed health benefits, but as a fabulously versatile ingredient used in food and drink the world over. If you feel adventurous enough to try growing your own here in sunny Sussex, it's probably best raised in a greenhouse or conservatory. Do choose fresh roots to cultivate (try a specialist greengrocer). Those from the supermarket are likely to have become too dehydrated and may even have been treated to stop them sprouting. We may not have any ginger plantations in Sussex, but we certainly have strong local connections worth shouting about. For at a farm in Portslade, near Brighton, husband and wife team Chris and Rosemary Knox work hard to produce their delightful Gran Stead Ginger Co's drinks which are a national - and international - success story. These non-alcoholic beverages are steeped in history – the original 150-year-old ginger drink recipe originated in the North of England where it was made in bygone days by a lady called Christiana Stead, who was born in 1898 in Middleton-in-Teesdale. Today, there are five drinks to choose from including new Blackcurrant with Zing, which combines fruity blackcurrant juice with just enough natural ginger to give the drink a gentle hum of spice. Try it warm. The spiciest of Chris and Rosemary's drinks is Fiery Ginger - be warned, this one is hot! Try it on Valentine's Day poured over creamy ice cream for a chillingly thrilling dessert to serve to your hot date. 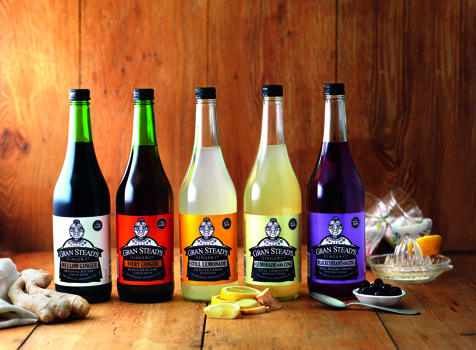 Read more about Gran Stead Ginger Co soft drinks.